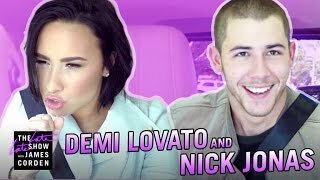 Nick Jonas and Demi Lovato go busking, talk purity rings and even sing DNCE's 'Cake By The Ocean'. James Corden's 'carpool karaoke' is one of those things we ALL get a little excited about whenever a new episode arrives online. This time we've been treated to one of the most hilarious carpool segments so far. We'll be honest, we LOVED every minute of this. When Nick chats about purity rings, you can see the sly smiles on his face! However the best part comes when he belts out his brother's single 'Cake By The Ocean', we could literally watch him sing this all day. The trio also decided to busk on the streets of L.A and raked in quite a bit of cash!